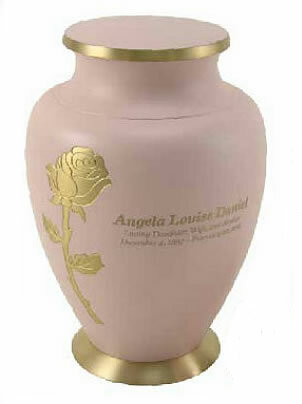 The Gold Rose Brass Cremation Urn features a single gold etched rose on a soft pink background with a matte finish. This urn is gorgeous! The soft pink, which can vary somewhat from very pale pink to almost a medium pink, is the perfect backdrop for the single gold colored etched rose. Optional engraving is available. Please limit engraving to no more than 40 spaces per line. Please allow 1-2 business days for the engraving process before urn ships. Please check your order to be sure the spelling and punctuation are accurate. You will not receive an engraving proof. The engraving will be to the right of the rose.